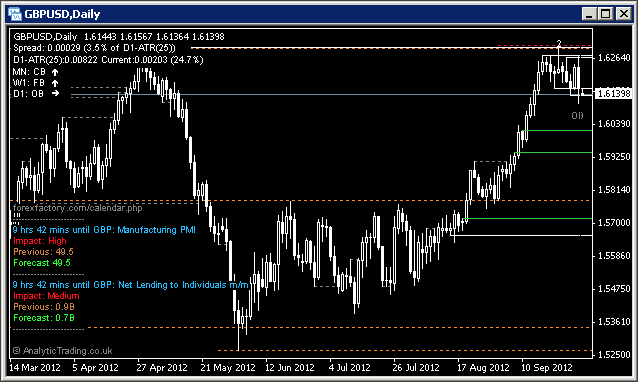 This template is based on the Bias and Levels template but with the addition of News indicator information and alerts. This gives you a quick way to set your charts with the default indicators, and include News information relevant to the instrument you are monitoring. We are first and foremost technical-analysis traders, trading the aftermath of news events. This does not mean that we do not follow the news, just that we do not trade the bullish or bearish bias suggested by released figures, but the actual market response to those releases. This means we need to know when relevant news releases are occurring to look for set-ups, and to manage trades, where the market bias may change. By default we will have this showing on at least our market risk sentiment monitoring chart, the S&P500, to stay informed as to the various events that may affect market sentiment towards the US Dollar – and therefore everything we trade that is priced against the US Dollar. We recommend you familiarise yourself with the economic News Calendars at ForexFactory.com and ForexPeaceArmy.com to build your understanding of what news is released, how often, and follow what effect it can have on the markets.